Games traditionally propel us forward with any one of these methods: increasingly tough bosses, collectable outfits, competitive skill points, unlocking new abilities, and, of course, story beats. Yoshi’s Crafted World is not like those games. For me, the paper carrot at the end of its fuzzy pipecleaner stick is discovering what charming and surprising thing will appear next in the game’s jumble of household items and kiddy art projects. After decades playing platformers like Mario, it’s easy to assume that the green, round semicircle you see in the background is a hill. The coral is made of coral and the sewer tops are constructed out of metal. With such mundanities out of the way, our focus is on the basics: platforming, puzzle-solving, collecting coins. 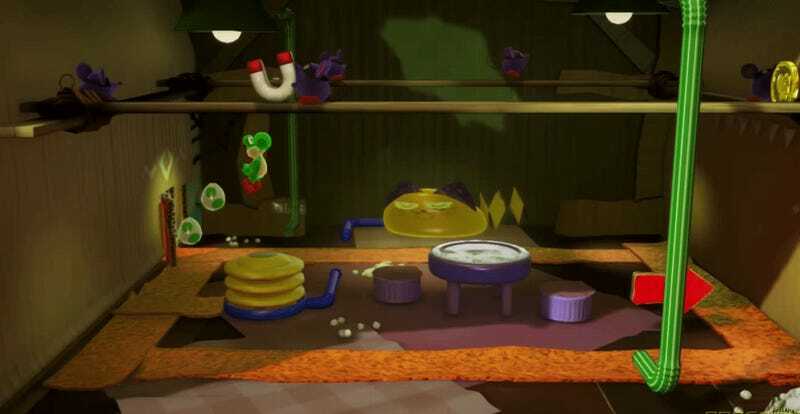 In the first few moments of Yoshi’s Crafted World, I saw that green, round semicircle and waddled along to collect the coins ahead before doing a double-take and, for once, walking backward. The hill was a paper plate painted green. Up ahead, the sewer was a severed cardboard toilet roll. The coral was pipe cleaners and the spinning windmills were sliced, fanned-out plastic cups. Forward is usually the dominant thought as we navigate a given platformer, but in Yoshi’s Crafted World, forward isn’t what’s getting me through the game. I don’t feel the need to progress as much as I want to take in the quaint posters (“Jelly beans / fruit favored,” “Yo’ster cookies hearts”), the trains with bottle cap faces, the random piles of empty coffee creamers. Absorbing every small detail, for me, is progression. 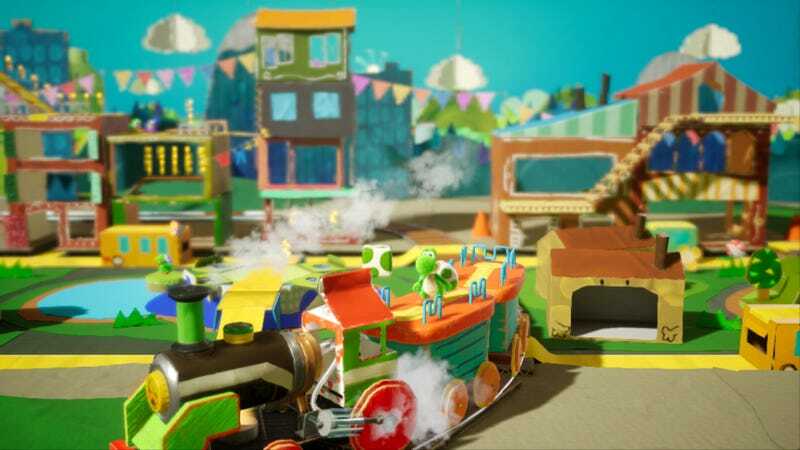 This almost Salvador Dali-ish approach to absurdity and spectacle isn’t new to Yoshi’s Crafted World, nor is it new to Nintendo games. Super Mario Odyssey, for example, is full of delightful quirks that made it stand out to me. I think back often on the game’s Sand Kingdom stage, a medley of red sand, transparent, icy beacons and Mexican-influenced fashion—all forming the foreground for a psychedelic Grecian architectural complex. In the distance, a man in a suit waited at a bus stop. “Trippy” was an understatement. Each small, strange touch hammered the idea that, while Super Mario Odyssey could be a game about collecting moons, to many, it would be a game about appreciating strangeness.